It's the best part of the year, the cooler days are here, and the holiday season is near. Cold weather is a lovely respite from the heat, but it can turn out to be harsh on your skin. Think of a dull and dehydrated complexion, chapped lips, and break-outs – some of the undesired effects of moisture-sucking cold air. Winter weather can strip the skin of its natural protection, opening up the outermost layer, allowing for irritants to get in and dehydration. So, it is very important to switch up your skin regimen to ensure that your skin stays truly nourished and hydrated throughout. Sukin, Australia's No.1 natural skincare brand* has you covered from head to toe with an array of winter wonders that will transform skin from drab to fab! While gel cleansers are great for removing surface oil and bacteria, they tend to strip the skin of its protective barrier, which can cause skin to become dry and flaky in the cooler months. Cream cleansers work to remove oil and bacteria while nourishing and moisturising the skin to keep it looking radiant and healthy. Botanical oils and extracts in Sukin's cream cleanser work to remove make-up and dirt build up on the skin, while a blend of Rosehip, Avocado, Sesame and Wheat Germ Oils nourish and hydrate the skin. An infusion of Aloe Vera, Cocoa Butter, Nettle and Horsetail leaves skin feeling soothed, clean and refreshed. Exfoliation is a must when it comes to maximizing the benefits from your skincare regimen, especially now that the weather has cooled. By exfoliating your face, your complexion is able to soak up all the antioxidants and nutrients your base needs to unearth its natural radiance. This scrub contains a nutrient rich blend of Kale, Spirulina and Parsley to brighten the complexion and improve the texture of skin. Natural Jojoba Beads and bamboo gently exfoliate and polish, leaving the skin feeling smooth and free of impurities. Pineapple and Licorice Root extracts assist to balance excess oils and tone the appearance of skin. Moisturisers are an absolute must have in your winter skin care regime to keep your skin feeling soft and supple throughout the winter months. Sukin's lightweight, but nourishing facial moisturizer hydrates and softens through a blend of Rosehip, Avocado, Sesame and Jojoba Oils. Soothing Aloe Vera refreshes the skin, while wheat germ and Vitamin E assist with improving the texture and protecting the skin's moisturize barrier. Treat your skin to a nourishing oil this winter to help lock in moisture and keep the skin feeling soft and supple. Sukin's Certified Organic Rosehip Oil contains no less than 70% essential fatty acids and has vitamins to help soothe, soften and hydrate the skin. These nourishing properties help to reduce the appearance of scars and combat the signs of ageing. This unique oil feeds the skin nutrients, and can be used regularly to help relieve redness due to dry/itchy skin and help maintain optimal skin health. This fast absorbing oil leaves skin looking and feeling radiant and healthy. Your winter skin care regime doesn't stop at your face. 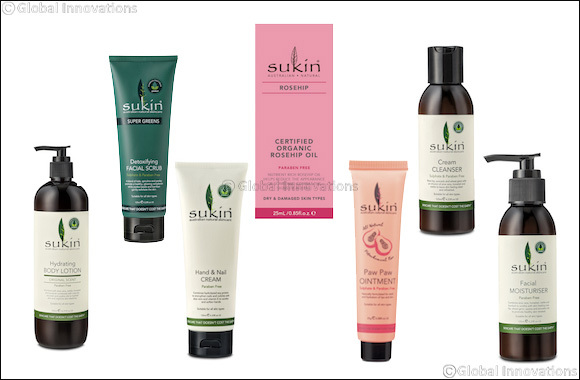 Sukin's aromatic hydrating body lotion replenishes and nourishes the skin's moisture barrier through its oil rich blend of Sesame, Rosehip, Jojoba, Avocado and Wheat Germ Oil. Enriched with an infusion of Aloe Vera, Nettle, Horsetail and Burdock, skin is left feeling soothed and hydrated. While looking after your face, body and hair, it's easy to neglect your hands, but it's super important to ensure you're caring for the skin on your hands every day, as they're one of the first places to show any signs of aging. Sukin's non-greasy, light hand & nail cream will hydrate and protect dry hands while caring for nails and cuticles from added Hydrolyzed Soy Protein. Hands will feel nourished, soothed and softened from Aloe Vera, vitamin E and Borage oil. Lips can become dry, chapped and irritated during the colder winter months, so it's important to replenish the delicate skin on the lips to keep them looking plumped and healthy. This Petrochemical Free versatile Ointment infused with Fermented Paw Paw, nourishes and soothes chapped lips and dehydrated skin. Combined with a blend of natural oils, wax and extracts including Castor Seed Oil, Vitamin E and Papaya Fruit Extract to hydrate and protect the skin's moisture barrier. Our multipurpose ointment may also be used to ease the discomfort associated with redness and itching due to dryness, while also improving the texture of the skin. Sukin is also now available in Lebanon at key pharmacies including Summerland Pharmacy, Arax Pharmacy and Express Pharmacy.